In an editorial piece in online media site, Daily Tribune, they explained the motives of those who oppose President Rodrigo Duterte and his administration. The editorial team first started off by attacking Senator Antonio Trillanes IV whom challenged President Duterte just recently. The writers said that this dare from Trillanes was “simply silly”, saying that it was only a tactic of the senator in order to bring the soldiers on his side. It can be remembered that the senator was a former Naval officer who lead the mutiny against then President Gloria Macapagal Arroyo, in a belief that she was further ruining the country and was not fit to lead anymore. Concept News Central said that this glaring statement from Trillanes was only a “bait” and “smokescreen” used by the opposition in order to “mask a plot to oust the president”. This ousting is allegedly plotted by Trillanes, “the Yellow Army of former President Benigno “Noynoy” Aquino III”, and the “largely spent communist movement. 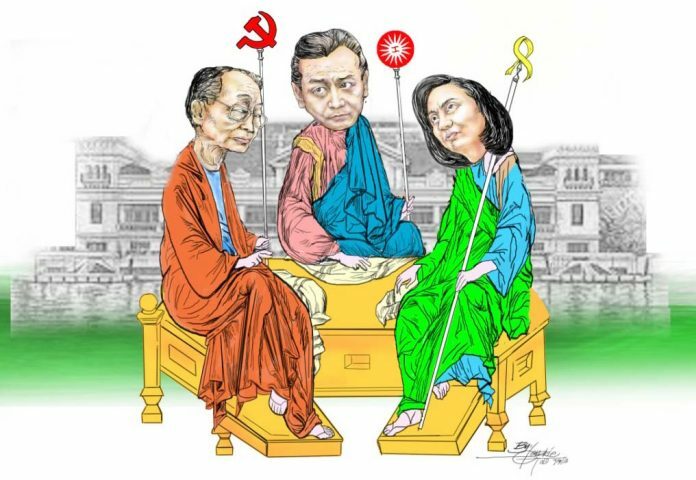 These three, the editorial calls an “unholy alliance”. 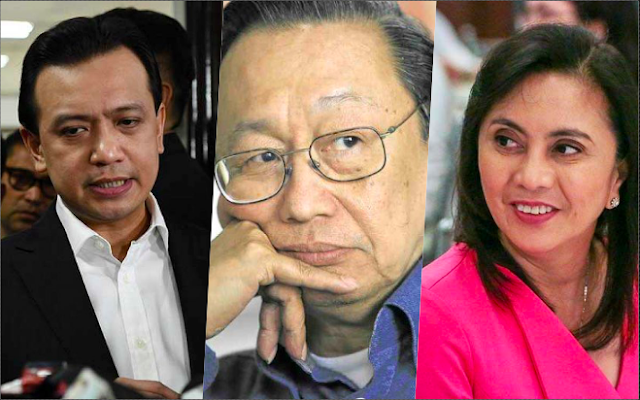 “The ties that bind Trillanes and the Yellows are plain to see. It was the former President who granted Trillanes the flawed amnesty. Now, Trillanes has assumed the role of the top attack dog of the Yellows in their bid to undermine the Duterte administration,” they said. It added that it is within the yellow’s best interest to have President Duterte out of his position because Liberal Party (LP) member and Vice President Leonor “Leni” Robredo will be replacing him in his position. However, they say that the alliance of this opposition is starting to lose traction, like Trillanes losing his amnesty, Robredo facing a challenge for her position against Senator Ferdinand “Bongbong” Marcos, and the communists allegedly retreating from their stance. Sen. Antonio Trillanes’ challenge for President Rodrigo Duterte to declare a revolutionary government and for government forces to arrest him without the benefit of a warrant from a court was simply silly. It was obviously a desperate ploy to stir the sentiments of the soldiers in his misplaced hope they will rise in arms against the government like he and his fellow Magdalo rebels did in the failed 2003 Oakwood and 2007 Manila Peninsula mutinies. Apparently, Trillanes’s bait was also meant as a smokescreen to mask a plot to oust the President. Unfortunately for the senator, Duterte is not a fool. Besides, he has been getting a stream of information on the real agenda of Trillanes and his cohorts. Upon his arrival from Jordan and Israel, Duterte bared that Trillanes, the Yellow Army of former President Benigno “Noynoy” Aquino III and the largely spent communist movement have formed an unholy alliance to topple him by October. The ties that bind Trillanes and the Yellows are plain to see. It was the former President who granted Trillanes the flawed amnesty. Now, Trillanes has assumed the role of the top attack dog of the Yellows in their bid to undermine the Duterte administration. It is also obvious that the Yellows have the motive to oust Duterte. If they manage to do so—and that is a big if—the constitutional successor is Vice President Leni Robredo. There is no denying too that the Reds want Duterte ousted. They have tasted power when Duterte bent backwards and appointed some Left-leaning people in his Cabinet, not to mention his offer to talk peace with the communists. However, the commies got greedy and demanded more concessions from the government. But Duterte saw what’s coming and blunted the moves of the unholy alliance, first by canceling the peace talks with the communists. He then revoked the amnesty given to Trillanes for being void ab initio and put him on the defensive, cowering inside his office for fear of being arrested anytime. Duterte noted that his mandate is to implement the laws and he is duty-bound to right a wrong—particularly the defective amnesty granted to Trillanes by Aquino—even if seven years had already passed. It would amount to dereliction of duty, according to the President, if he would disregard the research finding of the Office of Solicitor General Jose Calida which showed the amnesty of Trillanes was fatally flawed. While trying to put up a brave face, Trillanes sounds more and more desperate in doing so. The senator must be very concerned to learn it was Calida who looked at his records under a microscopic scrutiny and discovered he failed to meet at least two requirements of the amnesty. The first defect was his failure to file a formal application for amnesty while the other was his refusal to admit guilt in connection with his failed attempts to grab power. That Trillanes was given amnesty despite these shortcomings speaks volume about the ties between Aquino and the senator. Trillanes has a lot of reasons to worry because Calida has proven his legal mettle in his precedent-setting quo warranto case that led to the ouster of former Supreme Court Chief Justice Maria Lourdes Sereno. The senator must be busy looking for the best legal minds who can represent him in his bid to squirm out of the legal difficulties Calida had thrown his way. As to Robredo, who is being groomed as the leader of the Liberal Party—the political component of the Yellow Army—she is also bogged down in her own legal problems in the recount of the votes sought by her opponent in 2016, former Sen. Bongbong Marcos. 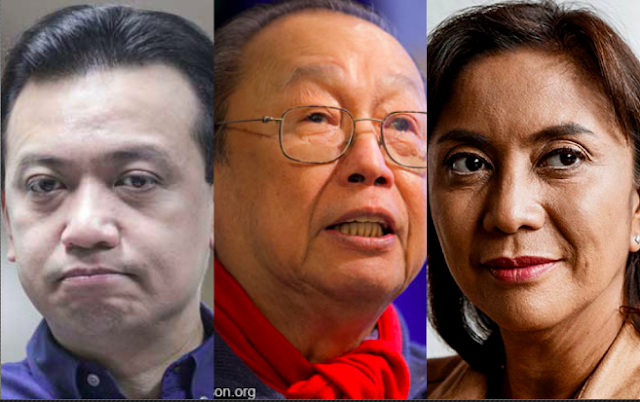 The last cog in the alliance, the Reds, are now on the retreat and their leader Jose Maria Sison is reduced to the role of making fake health reports on Duterte. Of course, no matter how bad their situation is, the unholy alliance may still try to proceed with its plans to oust Duterte. But that is definitely a Hail Mary move."